Vile and Pepetua Vile Setema received their Certificate of Long Service from Caroline Wedding. Giving out long service awards is one of the pleasures that makes her role as Auckland West Regional Manager so rewarding. Seeing her team members growing their CrestClean businesses and chalking up personal milestones along the way is a great feeling, says Caroline Wedding. And there were plenty of smiles all round when Vile and Pepetua Vile Setema received a Certificate of Long Service to mark three years as business owners. 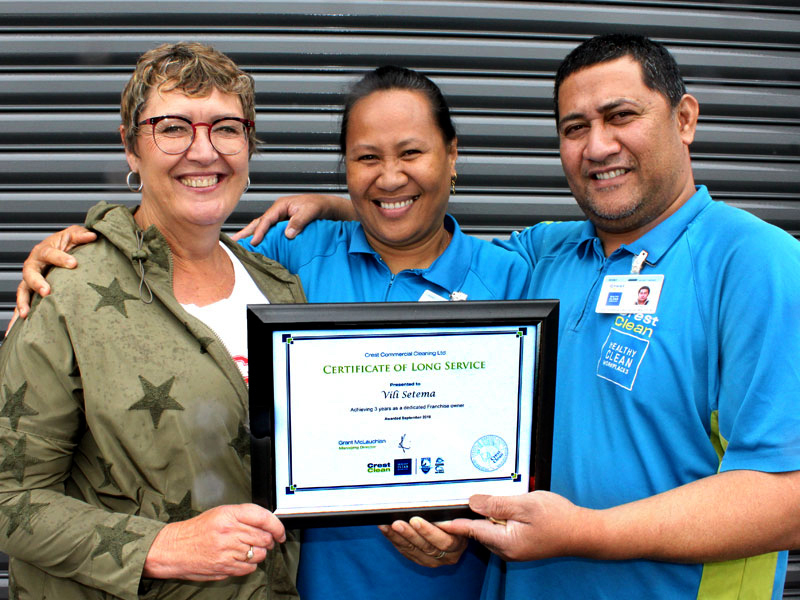 The couple have made a big impression at Te Atatu Intermediate School by their care and commitment and high standard of work, says Caroline. “They are really valued at the school and are part of the school community. They just do a fantastic job. Pepetua enjoys the flexible working hours that come with having a cleaning business. It means their four boys, aged 17, 15, 14, and 10, get to see a lot of their mum and dad.